Come out to find out what FIRST robotics is all about. What is FIRST? FIRST (For Inspiration and Recognition of Science and Technology) was founded in 1992 by Dean Kamen, inventor of the Segway. The mission of FIRST is to inspire local students to be science & technology leaders by engaging them in mentor-based programs that build a business, public speaking, coaching, & communication skills. We are looking to provide these students with the necessary skills to become the next leaders in our community & beyond. What is FRC? FRC stands for FIRST Robotics Competition. 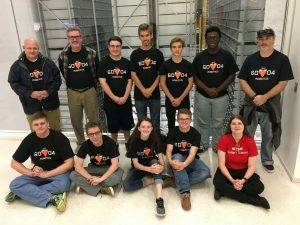 FRC is designed for high school student teams who want to compete head-to-head on a special playing field with robots they have designed, built, and programmed within a six week period. During the competitions, teams compete in an alliance format against other teams. Who is FRC 6004 f(x) Robotics? We are a diverse group of like-minded students who are striving to educate ourselves in the STEM fields. We’ve come from a small team of seven (with little experience) to now having over 20 members in our fourth season. Johnston County is a rural community and over 15% of its people live below the poverty line. Our robotics team represents all of Johnston County and is hosted by Smithfield-Selma High School in North Carolina. We are supported by local governments but they also have limited funding. We cannot continue without the support of generous companies like yours.